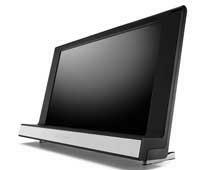 (without stand or speakers) 41.7" x 24.5" x 10.0"
BeoVision 8 is the flexible solution for your everyday viewing needs. Since we made it for both stand-alone use and as the perfect video display in a BeoLink setup. It's perfect for your playroom, kitchen, home office, and your living room.